The US and Australian cover both share the thing I love most about each cover: the lettering! The lettering on both are so frickin’ fantastic. The title on the US cover looks like it’s been written in an oil pastel. I love that it’s handwritten because it gives the cover and title a bit of personality, especially considering the cover has nothing else on it except the lettering. I also the smudges because to me, it conveys that things will get messy. Girl in Pieces talks about self harm and suicide, and the cover does a good job of showing that through the skin-toned color background and the red strikes through the title that seems to convey cutting without being graphic. It’s quite minimalistic, but it’s a powerful effect. The Australian cover has the title stitched into it (well, the cloth background). I like that the cover seems to convey that in this book, readers will see a girl trying to stitch herself back together like the title is doing. I love that the stitching has thread leftover, making it a bit messy, and that it’s made from two different color thread. The stitching isn’t exactly tidy, but what life is? Final Verdict: What cover do I like better? I think…the US cover. Which cover design do you prefer? 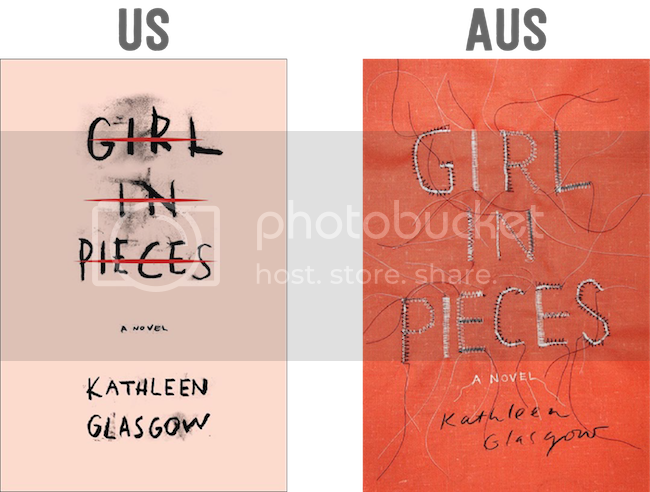 Would you buy the the US or AUS cover? Definitely US for the win on this one! That pink color and calligraphy has my heart. I agree with Tasya that the AUS cover looks too creepy. I’m not grossed out by blood but STITCHES IN SKIN IS TOO MUCH FOR ME SOMEHOW. It’s funny. I like the Australian cover. Somehow I found that it conveys more the theme of self-harm and suicide.